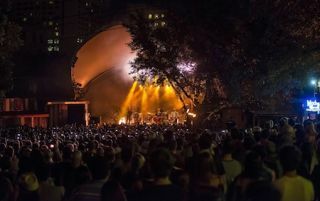 What do you get when you combine an amphitheater with a state-of-the-art PA, flowing water, big oaks, and legendary barbecue, all in the heart of a downtown Austin? The outdoor venue can host 2,100 SRO patrons, with another 150 in an additional VIP space. Music is essentially all over the board from indie rock, country and hip-hop. “We have it all,” explained John Mickan, Stubb’s production manager. The new system features a DigiDesign Venue SC48 console, with arrays with eight d&b J8’s, six d7b B2 subs speakers, and a rack of d&b D12’s. Fill speakers include d&b Q’s with a D12 amp. The monitor system includes another DigiDesign SC48 digital Desk with 10 Adamson 12MXi monitor speaker wedges and Crown macro amps. Adamson side fills are available if requested. No doubt Christopher B. Stubblefield, “Stubb” would have been thrilled with the amphitheater. An Army cook during the Korean War, Stubb had a passion for both barbecue and music, and founded the Stubb’s dynasty, so to speak. The adjoining amphitheater came in 1997 when one of the owners, a talent buyer, helped the venue realize the vision of large-scale shows.